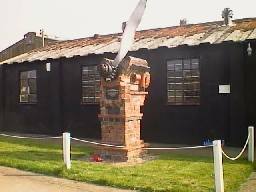 Metheringham Airfield Visitor Centre & memorial to Squadron Leader Robertson and crew. Housed in the former ration store of RAF Metheringham is an exhibition of photographs and memorabilia showing life at an operational airfield in World War 2. The base was home to 106 Squadron RAF, flying Lancaster bombers over occupied Europe. Nearby is a memorial to the squadron. Many parts of the old runways and perimeter track still remain.